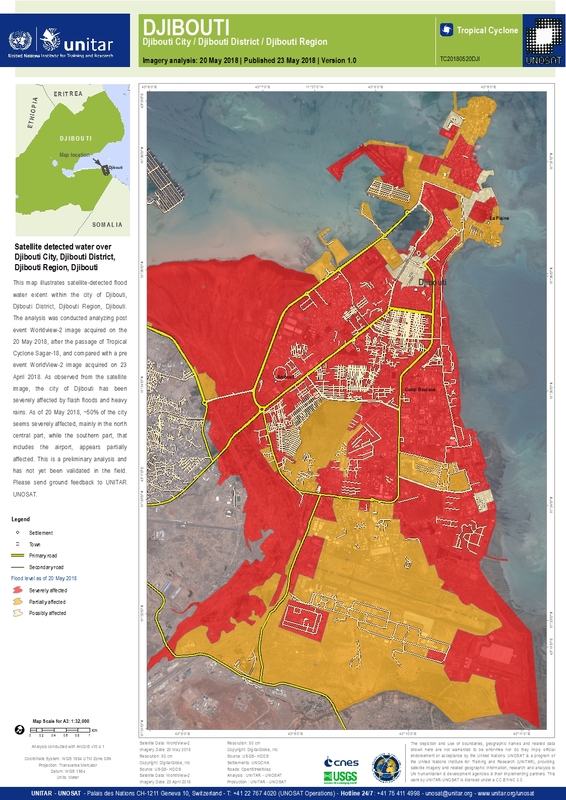 This map illustrates satellite-detected flood water extent within the city of Djibouti, Djibouti District, Djibouti Region, Djibouti. The analysis was conducted analyzing post event Worldview-2 image acquired on the 20 May 2018, after the passage of Tropical Cyclone Sagar-18, and compared with a pre event WorldView-2 image acquired on 23 April 2018. As observed from the satellite image, the city of Djibouti has been severely affected by flash floods and heavy rains. As of 20 May 2018, ~50% of the city seems severely affected, mainly in the north central part, while the southern part, that includes the airport, appears partially affected. This is a preliminary analysis and has not yet been validated in the field. Please send ground feedback to UNITAR UNOSAT.